The Rotoroll® Manual hose reel hose has an exclusive manual rewind mechanism, guaranteeing an effortless and faultless action, with no jamming and no breaks. Moulded in glass fibre reinforced plastic, the outer casing is shockproof, weather resistant and UV-stabilised. 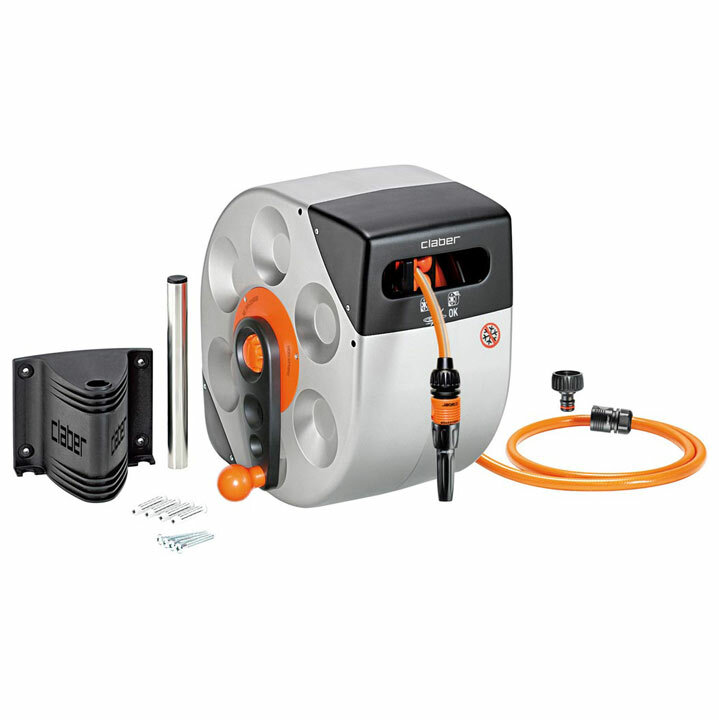 Complete with 20m (66') of special 9-13mm non-kink hose that is easy to rewind as well as resistant to high water pressure, a rust-proof aluminium wall bracket that swivels 180° leaving the hose straight and unrestricted when pulled from any angle, 2m (6'6") of lead hose, "quick-click" connectors, a spray nozzle, plus screws and masonry plugs for wall mounting.